Home » MTHFR » MTHFR, Folic Acid and Folate: Should I Eat It? 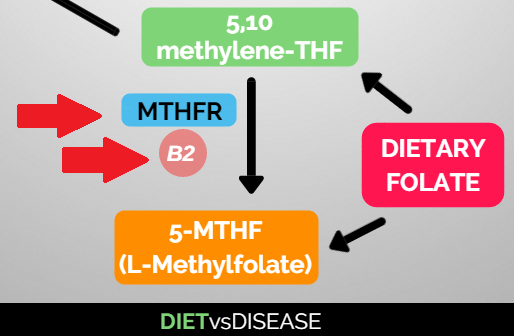 MTHFR mutations are well-known genetic variations that can impact folate metabolism. 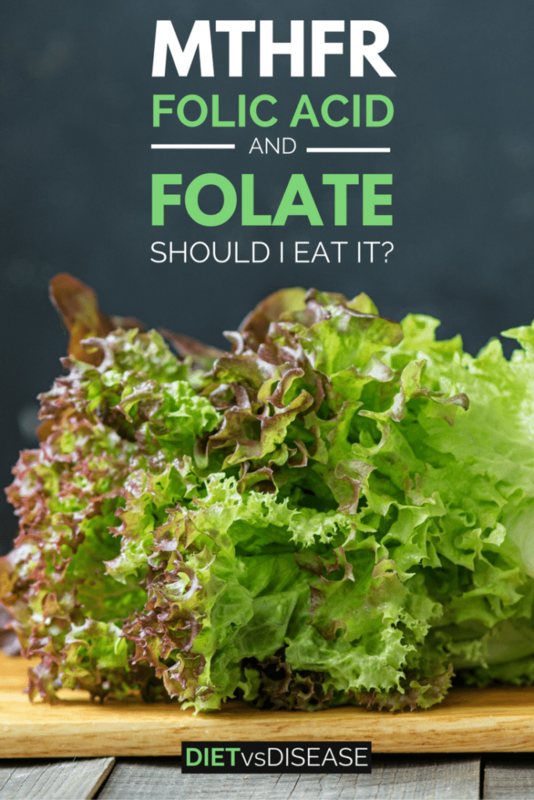 But there is a lot of confusion whether we should eat more or less folate. This short article explains it in human terms. What Is The Issue With Folic Acid? It’s fundamental to differentiate between folate and folic acid to understand the concept. 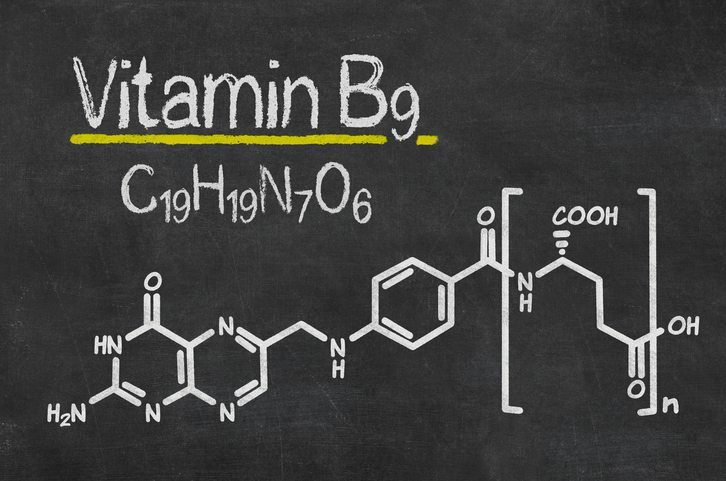 Firstly, both are similar types of vitamin B9 that we eat. The name folate even comes from the latin term “folium”, or what we call “foliage”. Folic acid is one of the folate compounds and can be found naturally in foods too, in small amounts. However, a “synthetic” version (it’s identical to natural folic acid) is also used in dietary supplements and added to foods, such as wheat flour. High doses of folic acid are typically used to treat folate deficiency and other conditions, such as Neural Tube Defects and high homocysteine (2, 3). The difference between folate and folic acid occurs during metabolism. In particular, the process of converting them to the active form of folate, called L-methylfolate or 5-MTHF. In this form, folate can be transported into cells and even across the blood-brain barrier. The human body must do this conversion because it cannot use folic acid or folate in its basic form (chemical structure). Folic acid we eat must always go through this entire sequence (above image), from top left corner to the bottom step, L-methylfolate. Notice the last step requires the MTHFR enzyme (blue box), produced by the MTHFR gene. This is because much of our dietary folate is already in the active form of L-methylfolate. Summary: Most of the folate and folic acid we eat must be converted into the active form, known as L-methylfolate or 5-MTHF. However, some dietary folate is already in the active form when we eat it and therefore does not rely on MTHFR. As mentioned above, natural folate we eat comes in a variety of compounds. This includes the active form of L-methylfolate. That means we all need to eat more natural folate, MTHFR mutation or not. It’s clear that an individual with no methylation (MTHFR) issues could get adequate amounts of active folate from food alone. Either directly as L-methylfolate or from other forms of folate (such as folic acid) that are converted during metabolism. However, an individual with a “severe” MTHFR mutation would need to consume large quantities of these foods consistently to restore – perhaps to maintain – adequate folate levels. For example, according to one germination study, 100 grams (almost 1 cup) of soybean sprouts contains about 0.8mg of total folate maximum. 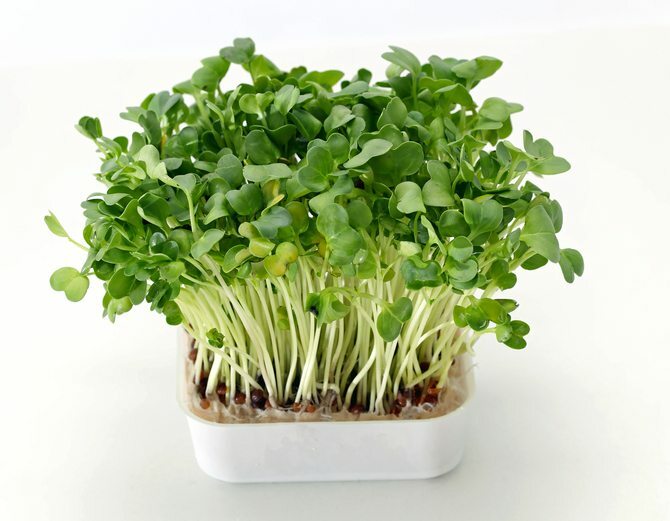 100 grams of mungbean sprouts contained about 0.7mg total folate (4). How much L-methylfolate was in those total folate amounts was not shown, but the average person just does not eat large amounts of those foods consistently. The recommended starting dose of an L-methylfolate supplement is 0.5mg, but that is pure L-methylfolate. Prescription varieties start at a whopping 7mg, so there is certainly some use for supplementation. What should I eat with an MTHFR mutation? Summary: Many foods naturally rich in folate already contain L-methylfolate. 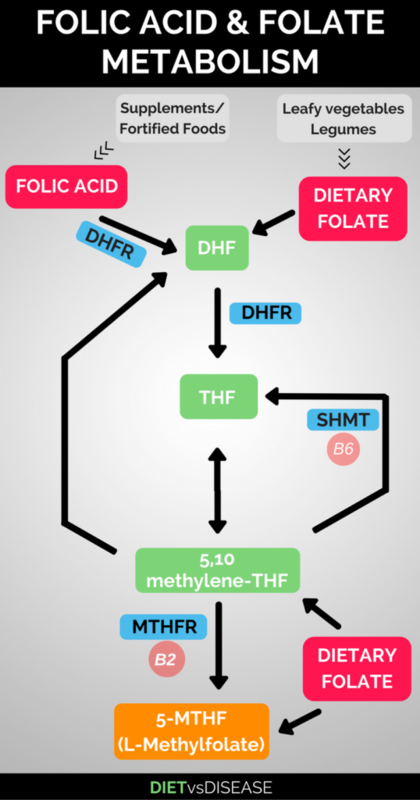 So the potentially harmful effects of an MTHFR mutation could be offset through a folate-rich diet in some scenarios. However, there is still a use for supplements. 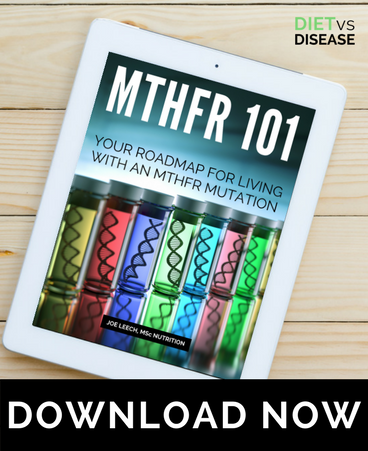 Those with an MTHFR mutation may not produce enough MTHFR enzymes. This means they may not consistently complete the final metabolic step that converts folic acid (and some folate) into the active form L-methylfolate. MTHFR enzymes are necessary for this to happen (as well as vitamin B2). Therefore folic acid supplementation and foods fortified with folic acid may be largely ineffective in these people. This could be a big issue if they have a folate deficiency, high homocysteine or are in the early stages of pregnancy and rely on folic acid. Some suggest that unmetabolized folic acid can bind to folate receptors, effectively blocking access by L-methylfolate. I couldn’t find any studies to confirm this theory though. 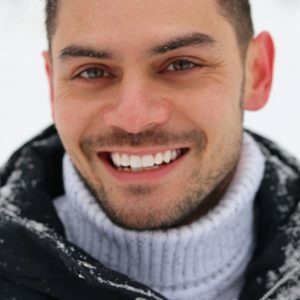 Others also say that unmetabolized folic acid in the blood is uniquely harmful, but there’s no evidence of that in the medical literature. The body is simply getting rid of excess (a good thing), which goes from blood to kidneys, and then out through urine. Summary: Those with an MTHFR mutation may not benefit from folic acid supplements or fortified foods. Theoretically a build-up of unmetabolized folic acid could be harmful, but it’s yet to be proven. Foods high in folate contain many different compounds, including L-methylfolate (methylated folate). For this reason we should all aim to eat more, particularly leafy greens and sprouted legumes… as though we needed additional reasons to eat more vegetables. 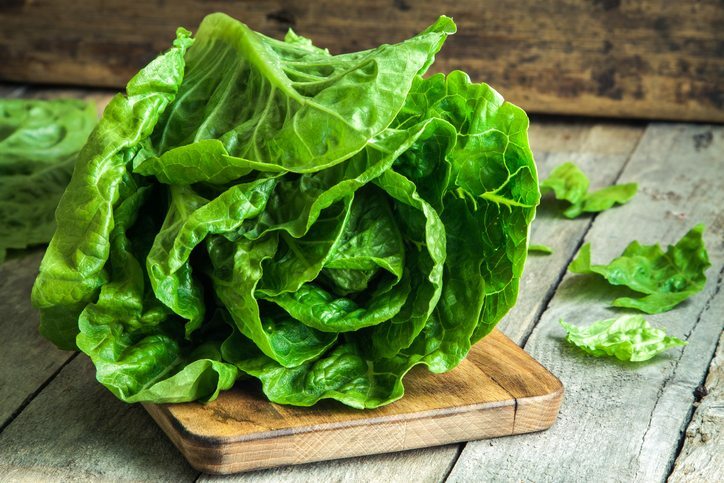 If you have an MTHFR mutation and do not frequently eat the folate-rich foods mentioned above, you may be at risk for issues related to low folate. This risk may be increased if you eat single sources of folic acid, such as folic acid supplements or fortified foods. For more information I recommend this roadmap guide I’ve put together.